My father was a fine shot and kept a shooting book for more than 50 years. He began shooting with Percy Bragg at Headbourne Worthy, but it was at Litchfield that he made his mark, probably after Carey Druce had given him his prized pair of Holland & Holland 'Royals'. For example, his book records shooting over Litchfield and Dunley on four occasions in September 1943 alone (as well as shooting stag on Mull on 27th September) with our step-grandfather Sir Alfred Herbert (known to us as 'Step'), Col Kingsmill, Sir Geoffrey Watson, Sir Ralph Sperling, Maj Deane, Maj Phelps, Capt Cornwall, Dr Ironside and his own father, Capt VA Lawford. Later entries bear the names of Sir T Dunhill, Sir E Bell, Percy Bragg and Air Marshall Sir Arthur Barratt. On some days, the party (usually of eight guns) picked up more than 1000 birds (pheasant and partridge) as well as numerous other game. 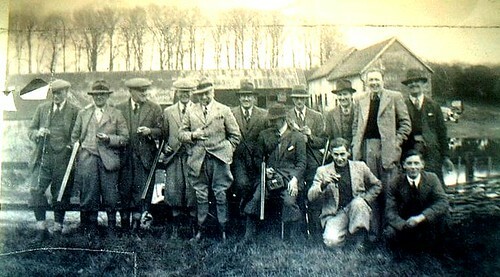 Sir Alfred Herbert (second left) and a shooting party c.1950. The woman sitting at the front is Sylvia Findlater (nee Lawford), Patrick's sister who looked after him when he was living at Litchfield after his first wife Catherine died. The dog is 'Danny' who was with the family until the late 50s. This suggets that the photographer and eigth member of the shooting party was Patrick. He shot at Eridge but when he came to Stocks, he created a more modest but highly enjoyable shoot with which he entertained his friends. Names regularly apprearing as guns were Jim Groves (from Cole Henley next to Litchfield), Adrian Henderson, Richard Onslow, Jim Harris, Bob Hennessey, Sir Peter Stanford, Air Marshal Sir Dermot Boyle, Admiral Sir Varyl Begg, John Sykes, Cmdr Colin Balfour, Maj Bruce Shand, Tom Faber, Sir Ian Jardine, Cmdr Dennis Bulman, Sir Alastair Down, John Sykes and many others. Significantly, Herry got his job at Thomas Miller as the result of his father shooting with Colin Balfour at Wintershill, where he met Bill Birch Reynardson. The story is mentioned in Herry's Trinity House retirement speech. Also, the flat in Shouldham St acquired when Herry and Piers moved to London in 1967 was also bought through his father shooting with James Wright, from his daughter Jane Whinney. This superb photo, which appeared in Country Life, is of Capt George Brodrick and his gamekeeper Norman Buckingham. Capt Brodrick bought the former Herbert estate at Dunley in 1979.